Anxiety which some may liken to fear, nervousness, concern, panic…whatever you want to call it, it can do a real number on our mental state which ultimately can affect our physical state and our day to day lives. It can keep us up at night, make us sweat in fear, and make us secluded from the rest of our family and friends. It’s nothing really to be ashamed of. Millions of people suffer or have dealt with anxiety at one time or another. As a matter of fact, over 40 million Americans have anxiety disorders. There are several symptoms which indicate that you may be having an anxiety disorder such as constantly worrying on a daily basis, being easily triggered or irritated, shaking and feeling restless, feeling tired, lack of focus on any one thing, always feeling tense, and being unable to sleep. If you’re having these symptoms, you definitely want to get a hold of this guide. If left untreated, it can consume your life and turn you into a complete mental and physical wreck. The consequences can be severe. 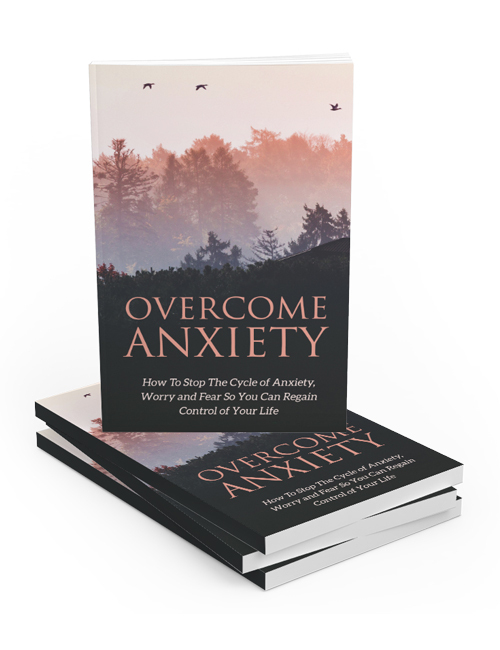 In this guide which you can download alongside the Overcome Anxiety video course, you will realize how to deal with and overcome anxiety and get a handle on your life. You’ll discover what anxiety is all about, understanding its symptoms and effects, how to lessen it with a series of techniques and practices, how to adopt an inner strength and focus to overcome it, how to get your sleep back on track, how to change up your life for the better and a whole lot more. Suffering in private is the worst way to live your life. You need help and you need to identify what the issue is at hand. This guide can help you in a huge way. Don’t delay and let it control your life. Anxiety isn’t going to go away by magic. Get this guide now and let’s kill your issues immediately.